I live in the ‘high’ part of Barcelona, and it’s so called because it’s where the peak of the mountain starts. If you continue going up you reach El Tibidabo from where you get the best views of Barcelona and you can also enjoy an aperitif at Mirablau or Mirabe. So, I get up, throw on the first thing I find and go down to have a coffee in Crusto (c/ Valencia, 246). 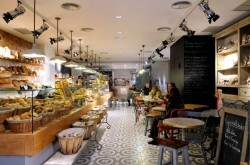 It’s a bakery-come-café and without a doubt, in my opinion, has the best bread in Barcelona. I order a white coffee and something from their ample selection of sandwiches, all made with the best of the best ingredients. A magazine, or maybe even the Guía del Ocio, accompany me while I enjoy this lovely coffee. I go home and get ready to go to work. My first stop is the Mercat de Galvany. Every neighbourhood in Barcelona has its own market and it has to be said that this is one of the best. It’s very clean and offers very high quality products. The market is on Carrer de Santaló, which also offers lovely places to have an apéritif, have dinner or just go out for a few drinks. This is what makes the street famous. At 10 am I’ve already finished my shopping and I’m ready to go to the Bistro d’Arte, a magical place where I’m lucky enough to work. I’m the head chef and enjoy cooking for my friends and friends of friends who look forward to coming to eat with me on Tuesdays and Thursdays. The Bistro is part of the Opera d’Arte, a shop-showroom of conceptual design full of lamps, chairs, armchairs and more, all designed by Patricia Martinez. At 5 in the afternoon everyone has left full and happy and I’ve finished my working day. At 5.30 I collect Olivia, my 3 year old daughter, and we head towards Turó Park, a park with a large variety of trees and plants unique to Catalonia, and whilst enjoying these lovely surroundings you can have a coffee or a ‘clara’ (like a shandy but with lemon, very refreshing!) in the outdoor café. As night falls we start our way home. It’s Thursday and we’re anxious for the weekend to begin so we get some friends together and go for dinner, better if it’s somewhere local so we don’t get back too late. The chosen place is Casa Paloma (c/ Casanova, 209). It’s a place that specialises in meat and in the downstairs part it has a really cosy bar in which after a fantastic meal you can go for a drink. On the way home, we have our last stop-off at Gimlet (c/ Santaló, 46) the perfect place for a good mojito [Editor’s note: And the best G&Ts in town I might add]. 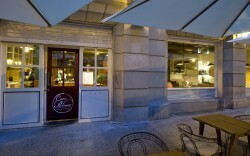 It has the widest selection of mojitos and cocktails in Barcelona and is the little brother of Dry Martini (c/ Aribau, 162). Both bars create their own cocktails for which they have won many prizes. Ale is head chef at Bistro d’Arte as well as head chef to Olivia and Ollie. She has been living in Barcelona for 10 years. Sounds like a lovely day, I like the end!! !